Candence Sinclair summers on her family's private island off the coast of Martha's Vineyard. She spends her time with her cousins Johnny and Mirren, and Gat, the nephew of Johnny's mom's boyfriend. The Sinclair's place high expectations on themselves. They aren't supposed to show weakness or imperfections. They aren't supposed to show all the cracks that have been forming throughout the family for years. Cady's grandfather is basically driving everyone nuts in his quest to leave the family fortune to the "right" heir. Add in: love and secrets and an accident which leaves Cady with a traumatic brain injury. To say that I'm a big E. Lockhart fan is really an understatement. I have read every YA book that she's written, and I've loved some and really liked the others. Like can we talk about how fabulous The Boyfriend List series was?? Ruby Oliver is easily one of my favorite characters ever. And Frankie Landau-Banks? How can you not love a book about boarding school and girl power? So yes, I'm a big fan and I was REALLY anticipating reading this book. So what did I think about the book? .......I have no freaking idea. Seriously. It's addicting and well written. And so unexpected. It's nothing like anything else I've ever read from her. It says in the beginning of the book that to tell people what this book is about would ruin it for them... and I kind of agree. I don't want to say too much because I feel like it is something you should read and make up your own mind about. My mind? Well, like I said, I'm still not sure yet. A big part of that has to do with the big "reveal" or twist or mindfuck. Whatever you want to call it. It freaked me out a little bit. And I'm not going to lie, it also pissed me off. It made me feel like that episode of Dallas where it turned out everything was a dream (if you've ever even heard of old school Dallas). Basically, I felt a little cheated at the ending. But I don't think everyone would react that way. I think maybe I've just been mindfucked too much in books (cough Shadowlands cough). I did like the writing and the family, friendship, and finding love themes. I also really liked the child-like main character who I was wary of for the entire book. I sort of love unreliable narrators, and I never felt like I could trust Cady. I liked her view of the world through her sheltered, damaged eyes. Even though I felt complicated about the ending, I really did enjoy this book. I read it super fast because I couldn't put it down (plus it is pretty short). I would definitely say anyone who reads YA should give this one a try. If nothing else, you'll get mindfucked. OVERALL: I don't know how to describe this book or how I really even felt about it, but I want everyone to read it anyhow!! It's something completely different from this authors previous books, but the writing is still just as awesome. How I got this book: Thanks to Netgalley and Delacorte Press for allowing me to read and honestly review this book. I can't rate this one guys. It's too hard!! I haven't read any books from this author before, I'll have to look into them more :) Great review! I think I need to read it again too!!! To understand it better and to figure out if I really like it or not LOL!! I've had this one on my TBR list for a while. Now I'm even more intrigued to read it. I've never read any of her other books, but I guess I should check those out as well. I've been hearing so many reviews saying the same thing! 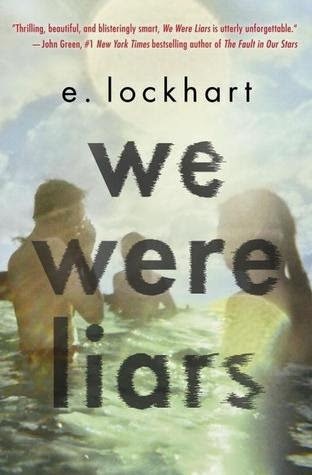 This will be my first E Lockhart book when I pick it up, so I'm interested to see what I think of her writing. I just finished this book last night! I had no idea how to review it without spoiling anything either. I was nervous about even saying there was a twist. I want to read it again to see if I can pick up on clues now that I know the ending. I know!!! Was I supposed to keep the fact that there is a twist a secret??? Very hard to review!